Obtaining quality water by collecting it from its source, through catchment and with improvements so as to avoid the many situations that are still prevalent, as shown here (Photograph from Caritas Ethiopia), where populations have no other choice but to draw it from unprotected springs. Because this is a process that is both simple and cheap and has been in use since ancient times so as to obtain pure water, easily, and close at hand, and most often for free. Spring catchment may also be more sophisticated and combined with the construction of a mini water distribution network using gravity feed to serve one or more villages located away from the catchment location (Refer to Factsheet E 45 “Construction of mini water networks”). Essentially the inhabitants of rural mountain villages or impoverished areas. There are three main methods for capturing and developing a water source : a simple one, another when a tank is added and a drainage method. The choice of method depends on spring characteristics (location, flow, significance, consumption needs to be met). If the spring’s emergence is precisely located and at shallow depth (less than two metres) and if the planned water consumption is less than the spring flow rate, then the simplest method is used. In similar cases, but where the flow rate is less than that required by consumption needs, then a storage tank must also be built. Lastly, if the way the spring emerges is diffuse or at a great depth, then drainage is required upstream from the spring. This can be applied when the spring emerges easily by itself and with an adequate flow rate. - The first step comprises, after first studying the terrain, water purity, flow rate, population consumption and expectations, cleaning, cutting, weeding, clearing and terracing until the ground’s waterproof layer is reached, and this with the help of the population, all around the spring. 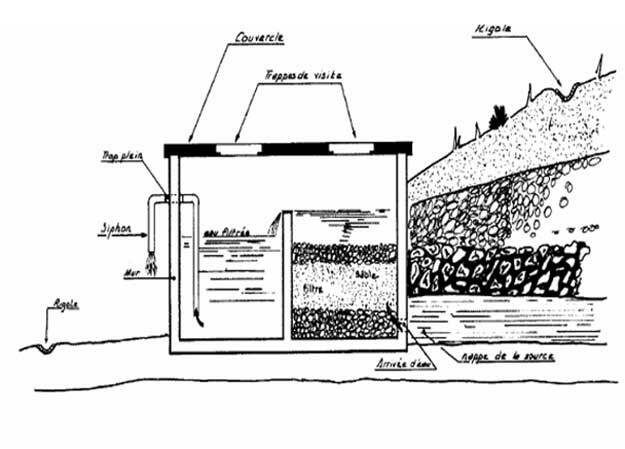 - The second step aims to bring together the streams of water in a well or catchment box. A ditch will dug to recover the water a little further along so that it is not polluted by contact with the last layers of terrain that it passes through. Then this ditch is filled with large rocks or stones that filter it, while still allowing it to run easily. 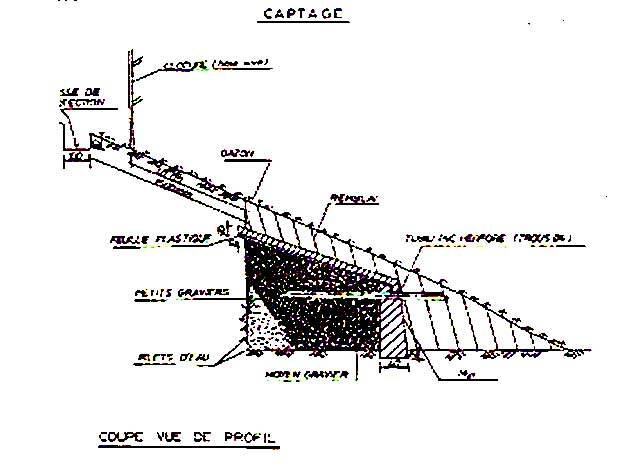 Once the filtering is performed using gravel, the end of the trench is fitted with one or more drain pipes and closed off with a blocking wall made from clay or concrete. The catchment box is then covered with mortar. Care must be taken to ensure that it is watertight thanks to a layer of clay or a plastic liner, or preferably, both. 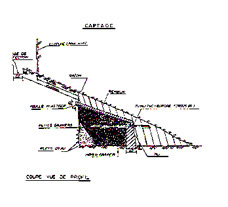 - The third step is creating an outer masonry work around the capture point and a concrete slab so that the spring area does not become muddy. 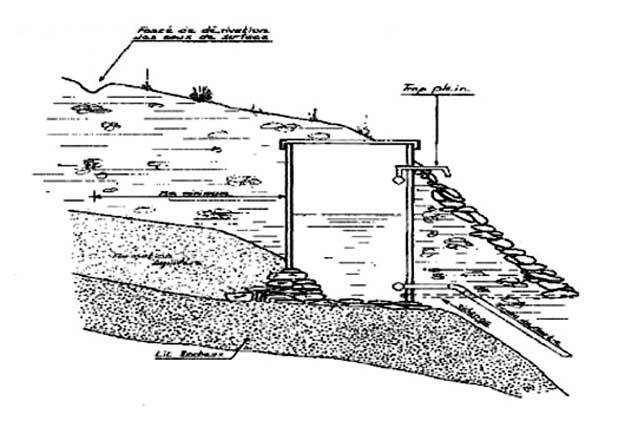 - The fourth step comprises protecting the works, the location and the catchment point (covering the catchment box with a layer or soil and grass, fencing off the reservoir, and putting into place, above and around the source, a protective channel to intercept run off waters and digging a small drainage ditch to take away unused water) as well as fitting it out, e.g. 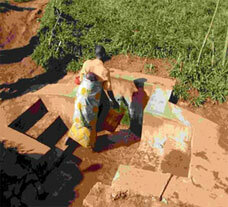 by providing small washing areas close by to facilitate the tasks undertaken by women. - The fifth step, after first ensuring that water purity is maintained after the works, is to ensure that the population has properly understood the notions of hygiene taught and that the management committee or town body that the spring is handed over to does indeed have sufficient expertise, and has taken the necessary measures, for keep the spring in good condition and maintaining it. NB If you find yourself in this case, there is no need to refer to the other two method, go to Section 6. 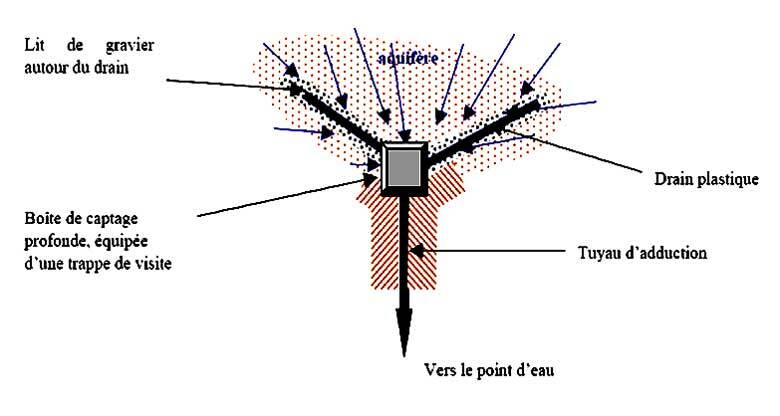 This method is used when the spring flow rate is too little to continually provide the population (or network it is connected to) with the amount of water needed, or when the need is to recover for other uses (e.g. irrigating neighbouring crops), any water not used at certain times during the day or night. 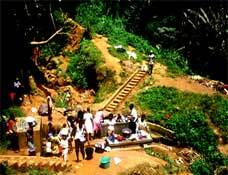 When the water is pure (as it is in most cases), then the spring water is collected by works similar to those described above, but replacing the catchment box with a tank. When the water needs to be treated first, the method is the same as the one described previously, only the tank comprises two compartments, one of which contains a gravel and sand filter. The water penetrates, it, rises through the layers of gravel and sand and runs off after filtering over the other side of the separator. 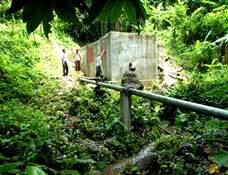 Then the water is taken from the tank by a siphon or sent onto a distribution network. This method is used when the spring emerges over a wide and diffuse area that often leads the terrain to take on a swampy appearance. Water catchment then requires a number of drains. These drains are perforated pipes that are buried in the ground so that water can be drawn from an aquifer simply through gravity. They are most often prefabricated but they can also be made up easily on-site using PVC pipe partially sawn or drilled and by closing off one end by melting it. They can also be made using pottery or rocks. Note that such drains are also placed sometimes to increase the capacity of a simple catchment area. Why fit drains ? Because when a ditch is dug in ground that is gorged with water, ready to fit a drain, then the water table naturally draws down and the diffuse water present in the ground tends naturally to run by gravity towards the drain. The drains carry the water to the spring catchment box. Fitted in ditches, they collect runoff water, carrying it towards the catchment box. When suitably laid out to catch as many trickles of water as possible, they are placed right in the bottom of the ditch, on a bed of gravel when the water is not too muddy. If not, then the drain is completely covered with a layer of gravel, preferably cleaned and graded gravel, some twenty centimetres deep providing a kind of filtration, thereby improving the quality of the drainage. The complete ditch is covered with a geo-textile or woven synthetic cloth type protective covering. It is also possible to insert sand between the gravel and the cloth to avoid tearing the cloth and ensure every tighter spacing between the gravel and the geo-textile layer to improve filtering. Once complete, the works are covered with soil. The water is collected in a catchment box that must be big enough that it can be inspected and maintained. It is taken to the outlet by a pipe. - Be sure to maintain the newly developed site, especially by defining a safety perimeter around it, so as to protect it from all kinds of pollution (fertilisers, animal excrement) that would pollute the water collected. If necessary, to protect the installation from erosion, fit runoff water catchment ditches. - The level of water in the catchment basin must always remain below the level at which the spring water emerges before the works start, or it may no longer be possible to collect spring water. It is therefore wise to also fit a basin overflow pipe. - It is necessary to closely involve the population in choosing, preparing and maintaining spring. - A prior terrain study must be carried out with great care to determine where to located trenches, at what depth and what kind of drainage is required (if the area is a very extensive one, then envisage a number of drainage systems in a T or Y layout, leading to the same catchment box). - Drainage profoundly changes the terrain where it is fitted. This is because the terrain surface that was previously soaked with water will dry out through water table drawdown and the countryside will change along with the vegetation, and surrounding populations need to be made aware of this. The water collected is generally of very good quality and can be consumed directly. The water points used are often traditional ones well known to the population (causing no change in habits and making it easy and safe to use). 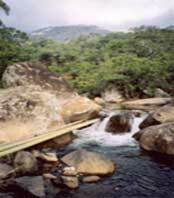 The water flow is generally a regular and sustainable one, but this must be checked out first, although there may be major seasonal changes in flow rates. The cost of setting up this installation is low. The works are durables so long as at least some surveillance is included. - The site will require maintenance and the landscape will change. The cost varies depending on the location and the characteristics of the spring, but a few examples offer some pointers. Generally, total cost barring complications, is significantly less than €1,000. In the Democratic Republic of Congo, the average cost (including management fees and the cost of hygiene awareness, but not including labour provided almost for free by the population) of springs put in place by CARITAS was €670 for the first programme of 515 springs. For the current 660 spring programme, where considerable effort has been made to train the population and management committees, the cost is €810. Another example, this time in Burundi, shows an average cost for the 143 springs currently being set up and equipped with washing basins by CARITAS, is €620, excluding the cost of management and training. The cost of setting up a complete mini water supply network six kilometres in length, from a spring, with drain chambers, tanks and standpipes, all as part of the same programme comes to€47,700. The rehabilitation of three other networks with an average length of 12 km does however have an average cost of only €16,000. The low maintenance costs will be covered by participation on the part of the population of some €0.07 per cu. metre from beneficiaries connected up to the network and a lump sum payment from others. to catch and development 660 springs, as well as providing hygiene and management awareness for 44,000 families displaced by the belligerents and who were in this way able to return to their villages (at a cost of €534,000). CARITAS is completing another program to set up 515 more springs, jointly financed by the Ministry of Foreign Affairs (€345,000). - In Gitega province, in Burundi, CARITAS with aid from SEDIF (the Paris Region Water Utility), is undertaking a programme to complete 143 springs, rehabilitate four drinking water supply networks (with a total length of 42 kilometres), to benefit 48,000 people and to build a rainwater collection system and latrines in five remove schools (at a total cost of €410,000). (Additional information is available from the Africa Department at the Department for International Action, Secours Catholique - Caritas France, 106 Rue du Bac, 75007 Paris, France). - PSEau (the water solidarity programme) : www.pseau.org . In French, from “Rechercher”, type “Sources”. A 745 page French work where Chapters 10 and 11 relate to spring water catchment and set up.